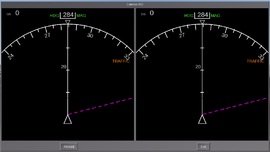 Demonstrate how a PUI/XML dialog can be used to easily prototype new NavDisplay styles, showing two (or more) instances for each pilot, which can be controlled/tested independently (using different settings for range, modes, traffic etc). Once the dialog is closed/reopened, the underlying navdisplay.mfd/styles files are also automatically reloaded from disk, so that you don't need to exist/restart fgfs to test your cchanges. 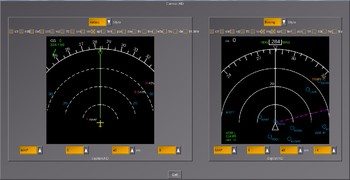 PUI dialog showing 3 independent NavDisplay instances with styling being customizable at runtime. Updated PUI/XML dialog showing different ND styles in use. 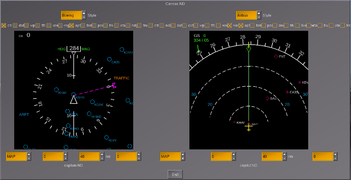 Screenshot showing a PUI dialog with two NavDisplay instances, featuring support for customizable resolution/size of the ND as well as selectable number of NDs to be shown. 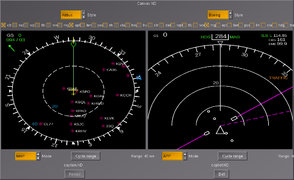 Screenshot showing Gijs' NavDisplay using the Airbus style created by artix in a PUI dialog with an embedded Canvas widget to render the ND and the corresponding widgets. 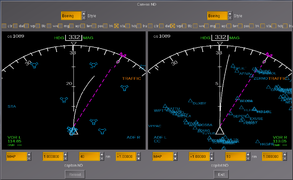 This is a PUI/XML dialog with multiple embedded CanvasWidget areas that instantiate independent ND instances using a subset of the code commonly found in the aircraft specific ND.nas file, adapted to use the embedded Canvas region for rendering the two NDs and GUI buttons/widgets added to control the whole thing without necessarily requiring a fully developed cockpit. This is primarily useful for rapid prototyping ("RAD"), i.e. quickly testing additions and changes without having to exit/restart fgfs and without having a full aircraft developed yet. In addition to the features mentioned in those files there are some undocumented features, which can be found in the dialog building routines (C++ code). Internally, a dialog is just a property tree - it is read and loaded into the/a property tree and then further processed (usually by C++ code). Now, what is taking place internally is that dialogs may not only contain the known XML markup, but may also contain embedded Nasal code blocks. There are really only two main ways to embed such code: at the dialog-level using nasal/open tags for code that is executed prior to showing a dialog that is already loaded from disk, and nasal/load blocks loaded per Canvas widget (the black area showing the ND texture). To be fair, there also is a nasal/close tag to do some housekeeping/cleanup (as well as arbitrary Nasal in bindings). Anyway, what is so powerful about Nasal embedded in dialog files is that the code is typically executed prior to the creation/display of the dialog, and the Nasal code gets a handle to the property tree representation of the dialog markup (processed aready by the XML parser). This "handle" is not just read-only, i.e. you get a mutable handle, which means you can traverse the tree and query it (e.g. to locate certain elements) and then freely add/remove or rename/duplicate elements, using the exact same APIs used to manipulate the global proeprty tree (e.g. props.nas). And that is basically answering your question: The XML file posted in the wiki is incomplete - it would not make any sense at all without the embedded Nasal portions, but it contains a few redundant nodes that are not recognied by the existing GUI engine. However, nasal/open block will specifically look for these redundant blocks and treat those as "templates" for certain widgets, e.g. those requiring dynamic contents (think a list of known styles, which cannot be hard-coded, think a list of MAP modes, ranges etc). Internally, the Nasal code will then locate a handful of useful blocks, instantiate (copy/rename, and customize them) and insert them into the appropriate locations in the dialog/property tree. This is why we may have only a single combo/select or "button" element in the XML markup, despite having possibly dozens of buttons: The code gets a copy to the dialog's property tree, and then duplicates useful/required nodes and customizes/renames them. What you have now found are leftovers from one of my debugging sessions - basically, all these strings are irrelevant placeholders, because they get overridden anyway. However, at some point, the code wasn't working properly, so that I added strings like "unchanged mode" to the XML - this was so that I could tell immediately which routine would fail replacing those placeholders, because that would show up prominently in a dump of the "procedurally created dialog". And that sums up the whole approach pretty well: The dialog only contains a subset of the required widgets/data, but it's using ~200 LOC to procedurally reuse those and replace those placeholders with more appropriate contents/variables. Anyway, none of this should be relevant as long as you really only want to use the dialog. As a matter of fact, I don't think that there are many other dialogs making such elaborate use of this templating technique, but it is this that makes it possible to instantiate an arbitrary number of NDs using different resolutions - because what is really taking place is that the corresponding settings are written into the global property tree, and then the dialog is closed, the GUI subsystem reset and the same dialog opened, this time picking up the defaults you set up using the previously closed dialog. maybe allow the style to be selected/changed at runtime, possibly per ND ? add a fullscreen option ? add tooltips, and mouseover events for ND elements - e.g. name of the layer/symbol etc ? add a mode to close the dialog and decouple the ND (no PUI overhead) ? Consider supporting an actual texture map (use one of the aircraft textures) to show a proper MCP instead of those checkboxes (ask Hyde/Gijs) ? 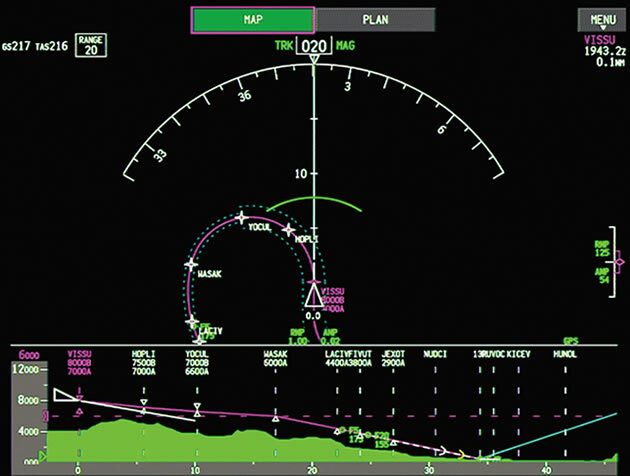 The canvas widget is procedurally added to the dialog using the techniques discussed at Aircraft_Generation_Wizard#Under_the_Hood. 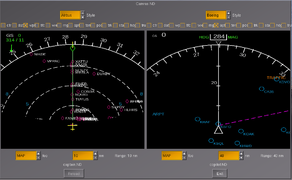 Note The following patch contains changes that move the definition of aircraft specific switches back into the navdisplay.styles file, adding GUI related fields to the hash, so that these can be used to procedurally create a UI without requiring an actual cockpit (including an optional values vector). In addition, this makes deletion of the Canvas by the ND optional, so that PUI based CanvasWidgets can reuse the ND without having to reallocate a new Canvas. Also, changes references to properly resolve to canvas.Path. # ND.nas file and map the keys to your cockpit properties - and things will just work. -# TODO: switches are ND specific, so move to the NDStyle hash! 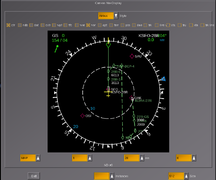 Screenshot showing PUI menubar with added Canvas NavDisplay entry for the Canvas ND dialog. Note The following can be split into a XML file and a nasal file - makes editing and syntax highlighting easier. However, variables used in the close block must be declared in the open block before the include of the nasal file. # TODO: support default style per ND, different dimensions ? ↑ Hooray (Oct 26th, 2016). Re: Canvas ND on another aircraft than Boeing and Airbus . This page was last modified on 24 February 2017, at 10:29.